Alaska Ski Tours, Northern Lights Tour Packages, Alaska Railroad Winter Vacations, Arctic Circle Aurora Borealis Tours, the Iditarod Alaska Sled Dog Race, Snowmobile Tours around Talkeetna, Ice Carving World Championships, Dog Mushing Events and Winter Carnival Activities in Anchorage during the annual Fur Rendezvous. It's all about Winter Adventures in Alaska ! Come and Ski Alyeska with excellent alpine skiing conditions and outdoor winter adventure recreational opportunities, Heli-Ski some of the world's most challenging deep powder terrain within the Chugach Mountains, stay in remote backcountry lodges and experience true Alaska hospitality and explore the wilderness with a snowmobile, on x-country skiis, snowshoes or with your own sled dog team. With more than 700 inches of snow each season and a base elevation of only 250 ft. - the lowest base of any major ski resort in the USA - Alyeska provides 1000 acre of exciting skiable terrain with gentle slopes and double diamond runs. 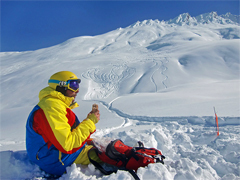 Enjoy heli - or snowcat skiing and deep powder runs with astonishing views of Turnagain Arm and the Kenai Mountain Range. 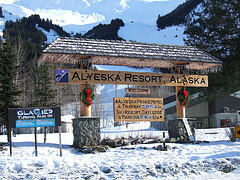 The resort is located 40 minutes south of Anchorage and accessible via the scenic Seward Highway. Heli Skiing or Heli Boarding within the Alaska Chugach Mountain Range and around Thompson Pass near Valdez provides pure adventure and enjoyment. The terrain with over 2.500 skiable square miles features magnificent glaciers, bowls, huge mountain faces and excellent deep powder snow conditions. The area receives an annual snowfall of over 65 ! inches. 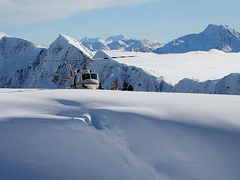 We offer a variety of exciting all inclusive Alaska Heli Ski Tours for the intermediate and expert skiier. Experience true Alaska hospitality and stay in a remote fly-in wilderness lodge above the Arctic Circle or in one of the many mountain resorts and experience Alaska’s great outdoors with your own sled dog team, a perfectly maintained snowmobile, or during a crosscountry ski tour with a phantastic view of the Alaska Mountain Range and towering Mt.McKinley. The clear and cold nights are providing outstanding Northern Lights Viewing opportunities.